A teacher suggested to a past student that I do her youtube branding work to help us both jump start our digital careers. This particular client told me she loved pink, bows, lace, and all things girly. I took that and ran with it. Here was the final selection! 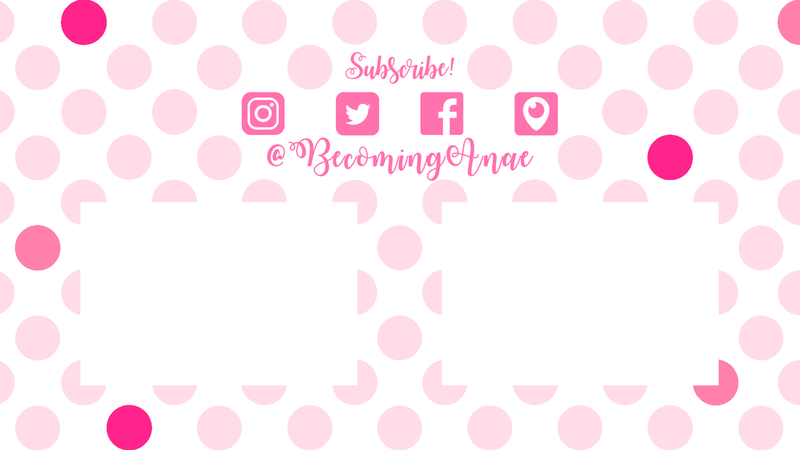 Between a logo, channel banner, and end credit slide, I knew I wanted to keep the consistency with colors, and femininity. With this I decided polka dots are both cute, simple, and fun. All perfect for the vibe the client put out. In addition to choosing the polka dots I selected a curly and cute font that is both sleek and bold to give a solid headline and demand attention while still holding onto the clients girly requests. I did tons of research on pixel sizes and resolution so my client could still achieve the highest quality for her banner, end credits, and watermark logo. After tons of trial and error, I was able to get her a high quality end result! Before we decided on the polka dots, I showed her an option that was colorful and girly. While the client liked it, I could tell we weren't where we needed to be and continued working. However, I enjoy making what Bob Ross would consider "Happy Accidents" because I was able to recycle this for a later project. Here is the logo I originally came up with for her that I created once I made the floral background. Again, we liked it but I knew she wasn't head over heels for it (no pun intended). So, back to the drawing board for me! My junior year, I submitted a cover for the graduation program because there were no rules stating it was a contest only for seniors. Although, I wasn't selected that year, I was told by the selection committee that I technically won but I was a junior and they just couldn't bring themselves to do that to the other contestants. So, my senior year I decided I wanted to step it up a little because my design from the year before didn't guarantee anything for the current year. Fortunately, I won the graduation program cover design contest. My first win with my work...ever. So yes, it is a big deal! After debating with the teachers about what they liked, we came down to these three. Sticking to the original idea, I kept the hard cutout with geometrical shaped in the back and placed the popular 80's font over top of it. It worked well but to me, it screamed 80's and not 90's. This ended up being the final cover at graduation and I couldn't have been more happy with it. I wanted to put something on the cover that was modern and out of the school's comfort zone. (Based on my time at the school, that was all I did). However, trying new things is good! Some say if it's not broke don't fix it but there's always a chance it could work a little better than it did in the first place. Does that make sense? I've been up all night and can't tell if I am putting together proper sentences. Oh well. Most teachers liked the light background but ultimately we chose the middle one because of the contrast in colors and the background pattern. Also, the words were more legible. 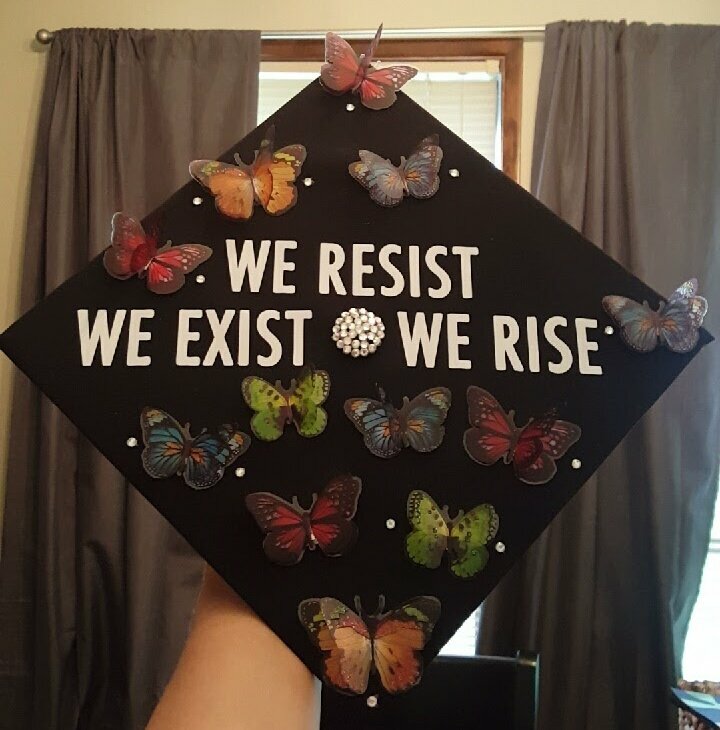 I made this grad cap for one of my best friend's. 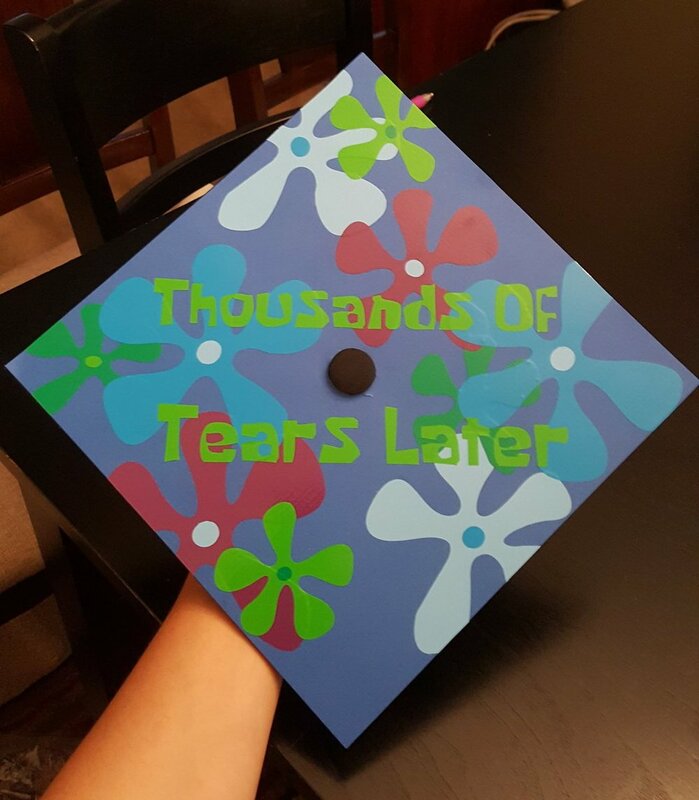 She is a singer and wanted that to be the main message of her cap. Not pictured are the pink wings I added later to the sides of it to add some extra character. This cap is great but it is also responsible for taking off the tip of my thumb. I don't want to talk about it. It's still too soon. Lisset wanted a powerful message and still a cute look. I was able to bring her idea to life with these cute 3D butterflies and rhinestones that everyone loves. I will always love Joanne the Scammer. Honestly. Truly. Clay wanted something American and not too girly. Like all of the other clients, she gave me an idea of what she wanted and I made a mock up of it in Photoshop. We tweaked things to make them just to her liking and she ended up loving the end result. When you faced her the top left edge read "In God We Trust" in the same sparkly letters as "TuHS '18". This was the first grad cap I made my sophomore year. It sure is something. Senior year I was recognized for my advanced graphic design skills and hardworking work ethic. I took on the role as Manager and Head Designer within the t-shirt business at our school. Although things didn't work out because of our creative differences, I learned a lot of things from how to not run a business and how to create an efficient and productive flow amidst the workforce despite constant curve balls being thrown our way. This was my favorite and our top selling design! It received a lot of hate but just as much love and appealed to most of the school's demographic and the pop culture of the time. In fact, it still was one of the selling designs even the year after I graduated. The marketing group all suggested putting the TuHS Logo in an outline of our state and I decided to do it up a little nicer and create something that was quick and easy for the Tees Crew to weed and press! This, like all of my other designs was included in this years shirt sales as well. Unfortunately, our school administration said no to the marketing team's initial idea of bringing back the notorious 'Tualatin Mafia'. After a lot of back and forth, we took our Principal's suggestion and decided on 'Timberwolf Nation'. Not our first choice, but it worked for us! With that, I paired the theme 'Hunting Season' and overall pop culture with the Nation idea. Thus creating these designs and more that were lost in production. I made two different Biggie Wolf designs this being one of them. 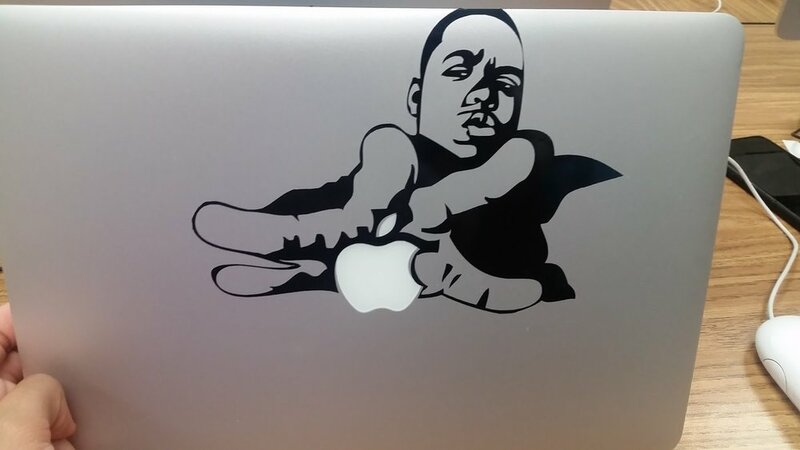 The other design looks like his "Ready To Die" album cover. Instead of those specific words I changed it to "The Notorious TuHS" at the top and "Ready to Win" at the bottom. Again, it wasn't approved by administration. As far as this design went, it went through sampling but never went any further as I resigned from my position. However, I still felt like sharing them! Finally, I have the original Timberwolf Nation design. I knew I wanted something simple to kickstart the merchandise for the school year in 2017. With the help of my friend, I was able to complete 100 shirts to start. It was always a seller but I noticed at a football game in the fall of 2018 that a lot of students were wearing this design. I then came to find out Veronica had used this very design as the all school shirt so every student received it for free. I am still torn on how I feel about that one! My sophomore year during my first round of independent study, my family helped me get in touch with a Black Lives Matter activist in Portland. I then went on to create the signature shirt of the PDX May Day rally for Freddie Gray and other black brothers and sisters who lost their lives to police brutality. Of course, the rally was much more than a shirt but with so much community coming together that day, putting those on caused us to stand out and show what we are fighting for in an artistic and powerful way. Since then, I still see my shirt at other protests and on TV when I can't make it downtown to march. This was truly a humbling experience that I will always cherish. I created flyers for Poetic Justice for a couple years and will always use these to show my progress over time. This was the first poster I did for Poetic Justice, a Portland based poetry group that gathers once a week to celebrate creative minds and the art of poetry. They wanted a general poster that could be quickly and easily updated for the weekly shows. I created this and overall liked it but knew eventually it would have to be changed due to the illegal use of the Poetic Justice logo. Sorry Tupac and Janet! I made this poster hoping I could get the admin to warm up to going in a different direction than the movie logo. However, after sending in what I had created he requested the old logo be put somewhere in the flyer. I still like this style a bit more than the older ones I created! However, I no longer make flyers for this group. After we cut ties with Poetic Justice, Amanda and I knew we wanted to continue to be involved in the community and celebrate the creativity in ourselves and others. Although, I did not continue on to run shows with her nor can I take credit for her idea, Amanda decided to start her own poetry collective. 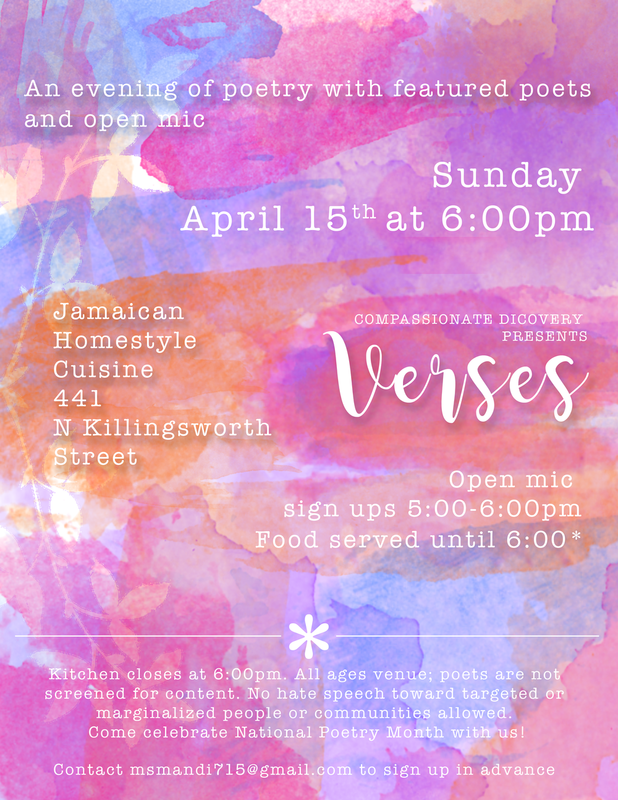 It is both a relaxed and comfortable environment where you can enjoy wonderful Jamaican food and freelance poetry. I was delighted to make her posters as she is one of my best friends now! 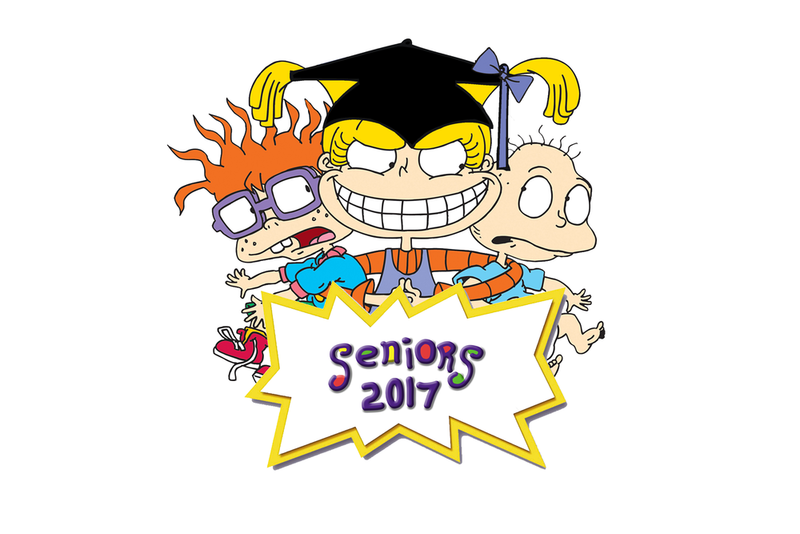 Although my senior shirt designs didn't win, they were number one in my heart. 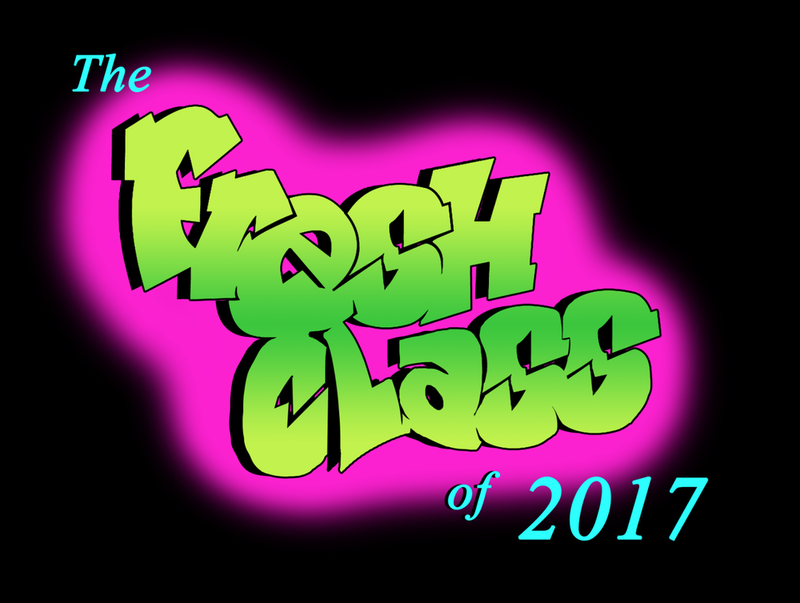 I made them older 90's style because we were the last 90's class to graduate. Isn't that fly? 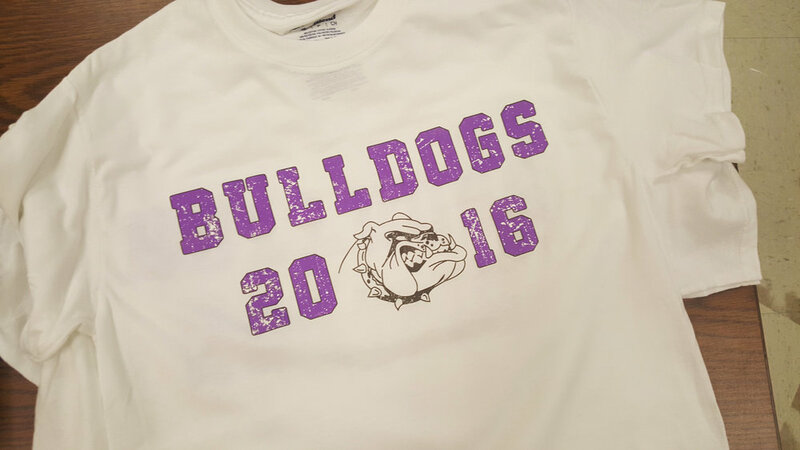 I didn't want to take no for an answer so I bought a set amount of Fresh Class shirts and sold them to many students. They wore them to different senior events until and after graduation so it counts as a mini win in my book! The hustle never stops when you are a sore loser, that's for damn sure. Veronica asked me to make a quick design for her son's 4 on 4 basketball tournament. I couldn't let them step on the court without throwing their favorite color in the design and the team mascot. 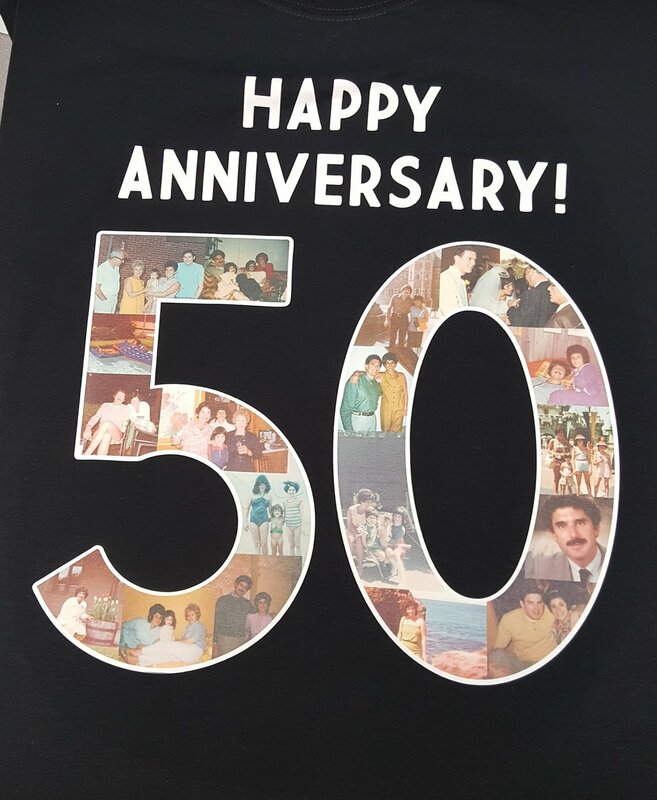 From customized M&M's to customized T-Shirts, I made everything you could think of for a huge celebration. I put together a heartfelt scrapbook for her parents with notes from all their dearest friends. I made shirts for all of the family with their names on the backs and their old pictures on the front in the 50. I created a photo line with twine and clips that had polaroid style photos of theirs. I printed larger polaroid styles of their wedding photos for decoration. 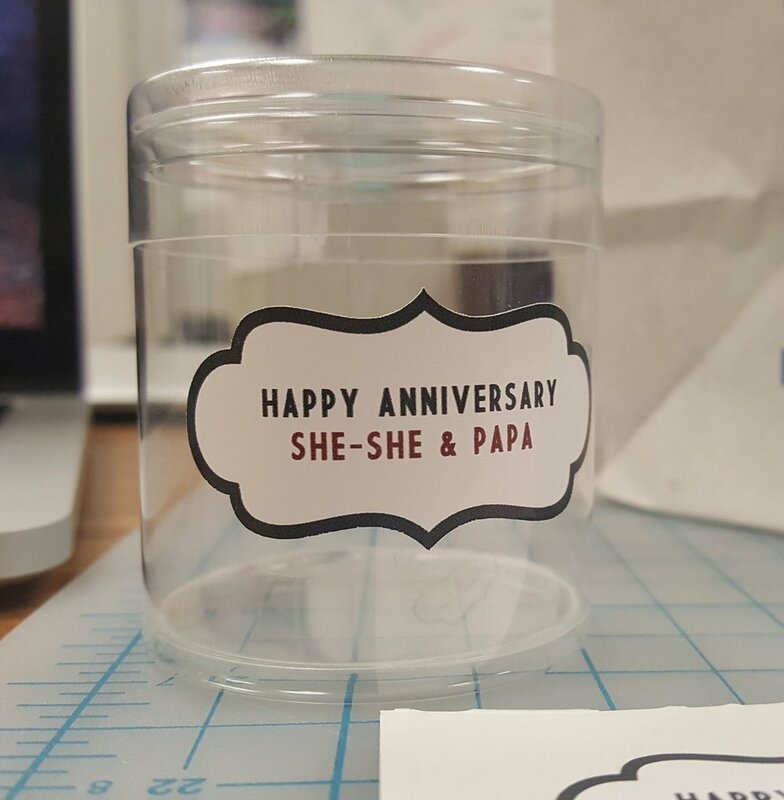 I purchased containers that would hold the custom M&M's that had their faces on them complete with colors that matched the customized stickers on the front of the containers. Lastly, I made a huge banner with all of the close relatives names! I started small with computer stickers and worked my way up to things like my Alice in Wonderland and Rappers set in my room. I also completed a huge job for Poetic Justice when the admin had his birthday. I stacked my drawings in vinyl on a black mat-board for his friends and family to sign.